Have you even finished reading a paragraph or page and realize that you have no idea what you just read? Some people think the right thing is to read it again… but why? You’ve already done the work – the readings been competed – why should you have to read it again? So continue to wonder off while reading… and never look back. Out of my four semesters so far in college, I’ve opened a book only three times. Conclusion: I never do the readings because what happens to me is explained in the comic. Somehow, my GPA is rocking! 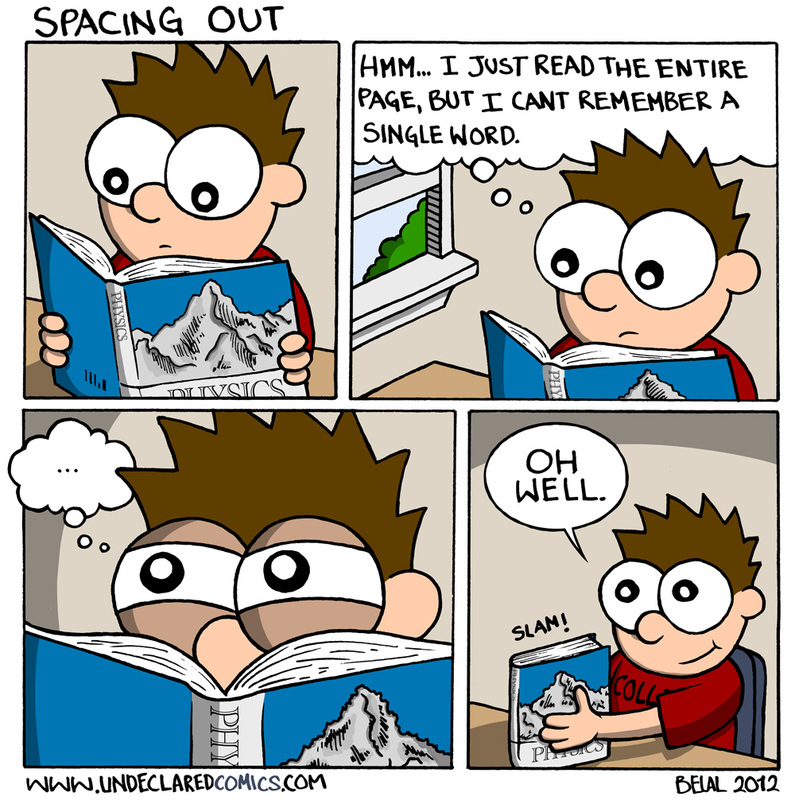 This just happened to me with my physics reading. I’m standing right behind you. Not exactly the same thing but I hate it when that happens to. I think this is more about when your brain is reading the words but is also thinking about something else and you only remember the something else. I’m reading this comic instead of my.. yu know. My gosh, i can’t even correclty finshe my sentences or do correct grammar. This is great! I distinctly remember doing this a LOT in Philosophy. Welllll I just read 40 pages about some people…I think. Works done, let the pizza begin!